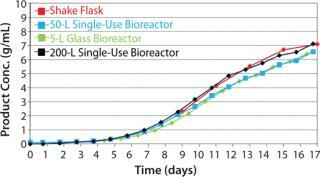 Fed-batch protein production processes have become more favored because of their simplicity under large-scale conditions. PAA laboratories′ ActiCHO media system is an industrial media package for the cultivation of Chinese Hamster Ovary (CHO) cells in large-scale applications. It contains all media needed from cell thaw until harvest in large scale, which are a stock culture and cell-expansion medium, a production medium, and two appropriate feed media. The formulation of each single medium is titrated carefully to complement the other. All parts of the ActiCHO media system are free of animal-component–derived substances. The media are available free of growth factors and peptides. This reduces the complexity of the media and reduces the number of critical components in each formulation. All media are also free of peptones, which is an important feature for reproducibility of production runs under large-scale conditions because peptones are known to have lot-to-lot variability. The ActiCHO media system consists of 100% single chemicals, whereby each is characterized in its chemical properties. All media are available in liquid as well as in powder formulation. The ActiCHO culture media were tested in a number of antibody and non-antibody processes at different scales. In general, cells grow well and produce high concentrations of recombinant proteins in the ActiCHO media system. The nutrients of the media are metabolically balanced, so that the accumulation of waste metabolites (lactate and ammonia) of cells is reduced to a minimum. 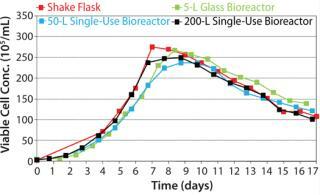 ActiCHo media were tested in representative fed-batch processes from shake flask up to 200-L stirred tank bioreactors in many different scales. It was important to test the ActiCHO media system also in single-use bioreactors, because they become more and more important in protein production. Figure 1 shows the cell growth in a typical fed-batch process in many different scales. Cells grow comparably in all scales and to very high concentrations up to 2×107/mL. To support cell growth to such high concentrations, media need to be rich in nutrients and need to be balanced at best. This typical fed-batch process achieves a product concentration of up 7 g/L (Figure 2). One of the main characteristics of ActiCHo is its handling under routine production conditions. In the processes shown the cells were fed linearly with the same feeding rate all over the process. This is a key feature of the ActiCHO system, which reduces the complexity, a prerequisite for large-scale production. Aziz Cayli, PhD is founder and CEO of Cellca GmbH, Germany. In cooperation with PAA Laboratories GmbH, Austria he developed the ActiCHO media system and can be reached at a.cayli@cellca.de.